Don Byas was clearly a rising star when he walked away from fame. He was the first to hold the Lester Young chair in the Count Basie, before his 30th birthday. After two years with Basie he moved to New York City, where he played and recorded with the likes of Dizzy Gillespie and Coleman Hawkins. In 1946 Byas toured Europe and decided France was the place he wanted to live, and so he did. 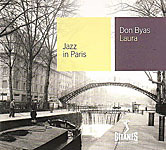 Laura is a compilation of several recordings made by Byas between 1950 and 1952. This is Byas in a swing mode, playing slow to moderate tempo standards and ballads, and he is nothing short of magnificent. His playing is lavishly creative and sensual, with a background strain of melancholy. This is romantic swing music with Byas's sax front and center, singing out line after line of beautifully constructed tenor solos. All three bands play capable, supportive roles, with the drummers consistently demonstrating a light touch. Occasionally, a pianist contributes a concise solo, with Art Simmons offering sensitive accompaniment and intelligent solo work throughout. But these are polite bands that graciously leave the spotlight to the saxophone. The gorgeous opener, "Summertime," sets the after-hours feel of the recording, and Byas never lets up. Laura is one of French label Gitane's Jazz in Paris series, notable not only for the quality of its releases but also for its handsome cover photos. Not since the old Blue Note covers from the 1950s and '60s has there been such an attractive presentation of jazz. Perhaps a few up-tempo tunes would have provided more variety to this recording, but for those in the mood for a master saxophonist playing some of the best laid back swing saxophone you're ever likely to hear, then Laura just might be the one. Track Listing: Summertime; Night and Day; Easy to Love; Where or When; Flamingo; Stardust; Old Man River; The Man I Love; Georgia On My Mind; Over the Rainbow; Laura; Somebody Loves Me; Old Folks At Home; Riviera Blues; Smoke Gets In Your Eyes; I Cover the Waterfront; It's the Talk of the Town; A Pretty Girl is Like a Melody. Personnel: Don Byas: tenor sax; Art Simmons: piano; Jean-Jacques Tiche: guitar; Roger Grasset: bass; Claude Marty: drums. (tracks 1,5,7,18). Don Byas: tenor sax; Maurice Vander: piano; Jean-Pierre Sasson: guitar; Jacques Medvedko: bass; Benny Bennett: drums. (tracks 2-4, 8-10). Don Byas: tenor sax; Art Simmons: piano; Joe Benjamin: bass; Bill Clark: drums. (tracks 11-18).